This giveaway has ended/ Congratulations to Diane from Michigan and Erin from Illinois who were randomly selected from all the people who entered. Check out the list below of what viewers submitted as their favorite cooking tool as part of entering this giveaway! To celebrate the fantastic support of readers to this site, I thought I would giveaway a few of my favorite cooking tools. These aren't expensive items, but just things that make my life a little easier in the kitchen. I'm actually not a gadegty kind of cook, I don't even use a garlic press as using a knife works just fine for me, but these are items that I use on a daily basis. You probably already have some of these items, but if you're like me, it's always nice to get a new set, and it's especially nice to receive it for free! 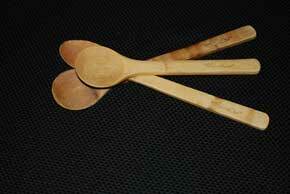 I love these Bamboo cooking spoons from Pampered Chef. They don't chip or split and they wash well in the dishwasher. If you use non-stick cookware, these spoons are great to use to maintain the integrity of the cookware finish. The spoons pictured on the left are mine, the winners will receive new ones! As part of this giveaway, viewers were asked what their favorite cooking tool was. What a great list! If you are looking for an idea for a wedding shower present or just want to expand your cooking tools you might find some great ideas from viewers on this site. Their favorite tools included: kitchen shears(2), pampered chef chopper, wire whisk, mix and chop from pampered chef, pampered chef mini spatula, wire ship, Tupperware quick chef food processor, wine(! ), garlic press, spatula, chopper, zester, spoons, tongs, food processor(3), flexible cutting boards, rubber spatula, peeler, cast iron skillet(2), KitchenAid food processor, KitchenAid stand mixer, spaghetti fork, crock pot, bowl, silicone utensils, Grandma's potato masher, bamboo cooking spoons, wooden spoons. What a great list of kitchen tools!